The potential of unconventional gas and light-tight oil (LTO) supplies are both significant and wide-reaching, the International Energy Agency’s (IEA) Executive Director has said. Speaking at the Baker Institute in Houston on 17 August, Maria Van der Hoeven described the rise of unconventional gas – sources of gas trapped deep underground by impermeable rocks, such as coal, sandstone and shale – as an energy revolution. From no production 25 years ago, in 2010 shale gas accounted for 23% of total gas production in the United States, according to the US Energy Information Administration. She also highlighted excitement surrounding potential LTO – conventional crude oil trapped in geological formations with low permeability (e.g. shale) – production of which is expected to grow by more than 1 million barrels per day in the next five years. Ms. van der Hoeven warned, however, that while worldwide unconventional gas and LTO supplies are considerable, whether they meet their full potential is still subject to serious uncertainties. 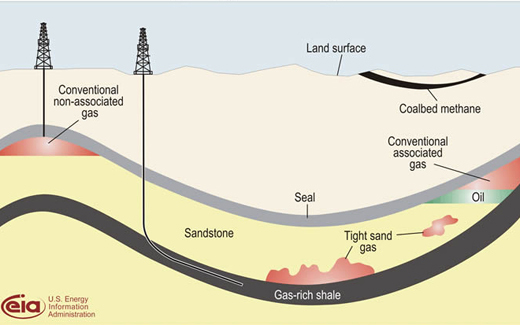 Unconventional gas is commonly extracted by a method known as hydraulic fracturing: large volumes of water (mixed with some sand and chemicals) are injected underground to create cracks in the rock. This frees the trapped gas which can then flow into the well bore created by the drill and be collected. A similar process is used to extract LTO. While the process of hydraulic fracturing has been around for years, the rapid increase in the number of North American wells, as well as the large number of companies which drill them, has put a spotlight on these issues, Ms. van der Hoeven said. Ms. van der Hoeven flagged an IEA report released in May which sets out some ‘Golden Rules’ – principles that can help governments, industry and other stakeholders to address the social and environmental issues. The IEA Executive Director admitted this is a different balance to strike.